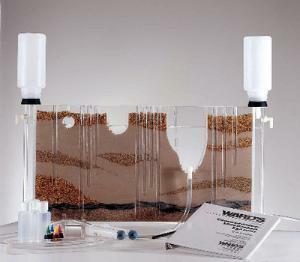 The Groundwater Simulation System demonstrates the impact of environmental factors on groundwater resources. Teachers can give a single demonstration of basic groundwater principles or utilize the model for numerous hydrogeology labs. Concepts such as porosity and permeability, rate of groundwater flow, characteristics of aquifers, formation of a cone of depression, well contamination, surface leaching of pollutants, and more are brought to life. Teachers can also add dye to show groundwater flow lines, the effects of pumping wells, and the impact of groundwater contamination on freshwater supplies. The system measures 1½ x 15 x 30". 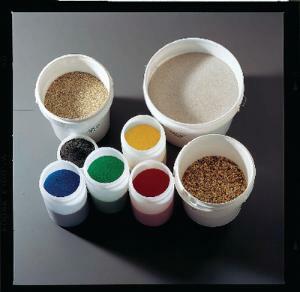 Ordering information: This kit includes a clear acrylic tank and stand, two plastic recharge bottles with stoppers, four types of sand and gravel, funnel dispenser for tank setup, two 60 cc syringes for dye injection and well pumping, water soluble dye, and all the necessary fittings for system water flow and drainage. Its also includes a user’s guide with operating instructions, suggested demonstrations, and background information.